I went to the grocery store today to buy the missing fixings for tomorrow's repast. It's snowing here. It's a wonderful snow, soft, gentle, peaceful. The temperatures are warm, hovering around 30 so you just need to dress comfortably to be able to be in it. I chose not to go to Iowa for Christmas again this year, based solely on the weather. The Midwest was to get snow and lots of it. On Monday, before the heavy, wet stuff wandered through, the "technical" term bandied about was "pounded" beginning on Thursday. I made the decision that driving in "pounded" was not something even I, in my 4-wheel drive Jeep, wanted to deal with. Yet, as I'm loading my car at the grocery and unloading it at the house, I think, "This is nothing. I could have driven home in this times two." And I feel rather silly for deciding not to travel. But when I sit down at the computer and pull up the news feeds, as the chicken cooks for tomorrow, I read this headline. 9 inches in Des Moines? Wha? I pull up the radar. Honestly, that doesn't look that bad. Illinois looks worse. So, I call my mother. She just laughs. They have a foot and it's still snowing. 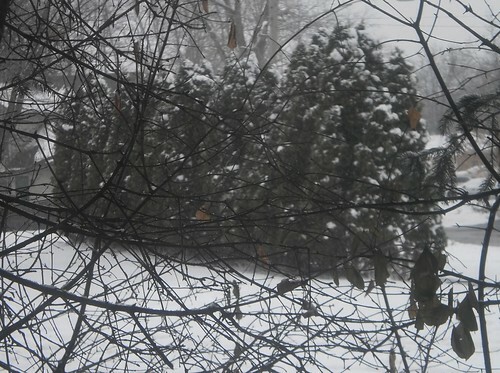 Granted, it's a nice snow, not heavy or wet, perfect "Christmas snow", if you will. It's just that there's an abundance of it. So, my hesitation at heading west and my ultimate decision not to go were correct. I probably could have gotten to Cedar Rapids, but continuing on to my mom's would not have been a good idea. Even with 4-wheel drive, county gravel roads can be risky, at best, in the winter. 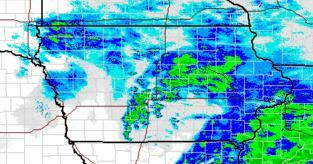 Now why would a storm hover over Iowa? Everything stops in Iowa because it's a great place to stay.